Kick off the event with a FUN RUN with your pup starting at 10:00 a.m. Don’t have a pup? That’s OK! Walk through Quiet Waters Park with your family and friends (2 or 4 legged), at your own pace. 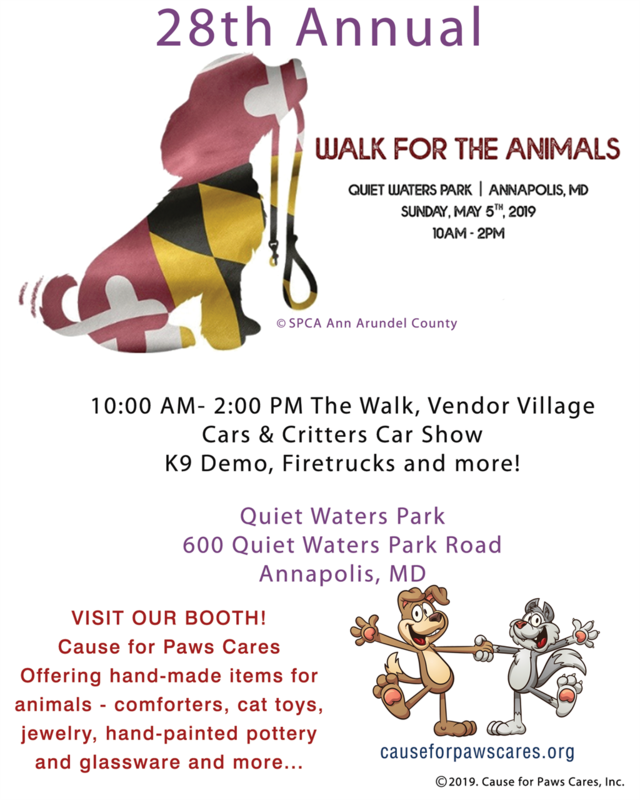 Stroll through Vendor Village and meet the wonderful rescue organization, Cause for Paws Cares, Veterinary Hospitals, Pet clothing providers, Artisans, Home Remodeling, and many other vendors who love animals just as much as you do! Copyright 2015. Cause for Paws. All rights Reserved.. Cause for Paws Cares is a 501(c)(3) non-profit organization. Bowie, Maryland 20715. We are a nationally recognized Nonprofit Charity, 501(c)(3), focused on pets and community animals. 47-1824249 Cause for Paws Cares Inc.
We interact and work with the City of Bowie Animal Control, Prince George's Animal Management, veterinarians and animal hospitals, animal adoption and shelter centers and local residents for animal wellness, protection, rescue, and adoption. The cost to taxpayers is staggering. By helping us, the taxpayer burden is reduced. Education on community animals is virtually non-existent. Our education and outreach programs impact lives - both animal and human. Seniors, families with reduced and little income, neighbors and friends, are surprisingly not aware of help close-by or feel shame in asking. Our assistance is deeply passionate and far reaching. Help Us Care for the Animals! Every little bit helps! Your donation may be tax deductible, we are a 501(c)(3) DONATE to Cause for Paws Cares, Inc.